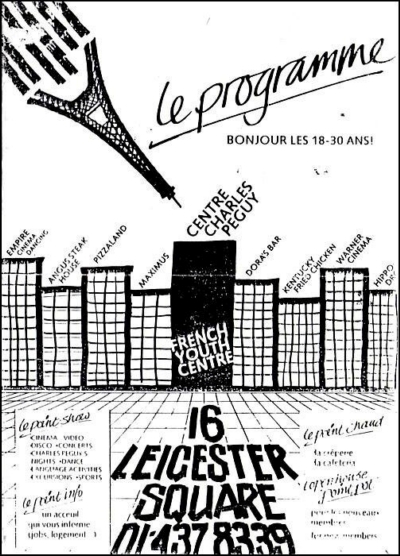 Association à but non lucratif, le Centre Charles-Péguy a été fondé en 1954 à Londres, avec pour mission d’aider les jeunes Français dans leur insertion sociale et professionnelle. Il est subventionné en partie par le Ministère des Affaires étrangères français et soutenue activement par le Consulat de France à Londres et rattachée au Centre d’Echanges Internationaux (CEI). Le Consulat Général de France est ensuite devenu partenaire de l’association, qui est alors passée sous droit anglais (Charitable trust). La vocation est d’accompagner dans leur insertion professionnelle et sociale les francophones âgés de 18 ans et plus souhaitant s’installer à Londres. Jon F Yes that is the door from Leicester Sq. (blue in my time)The windows above were the 2nd floor dance hall and office on 3rd floor. You would never know it was a club m there was a back way in through the church . Adrian And of course we all recognise Gérard at far right! Le Centre Charles Peguy is intimately connected to the catholic church Notre Dame de France situated in 5 Leicester Place. 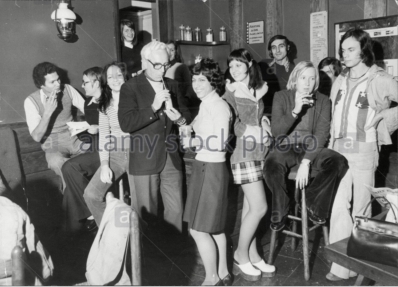 The club was actually inside the premises of the churchalthough I don't know if there was a way between the two. 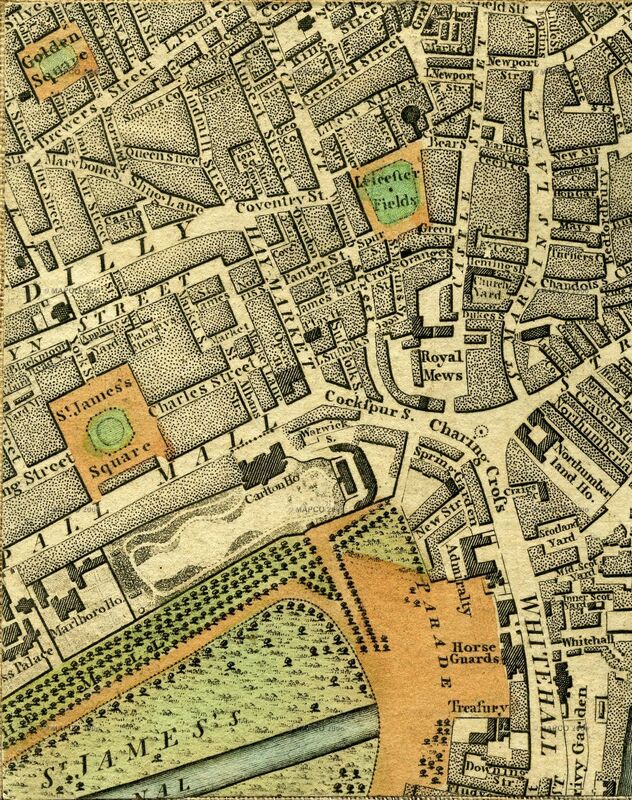 At about 1789 Robert Barker acquired a plot of ground on the east side of Leicester Place, together with a large site at the rear with access to Leicester Square, and here he erected a circular building specially designed for the exhibition of his panoramas. 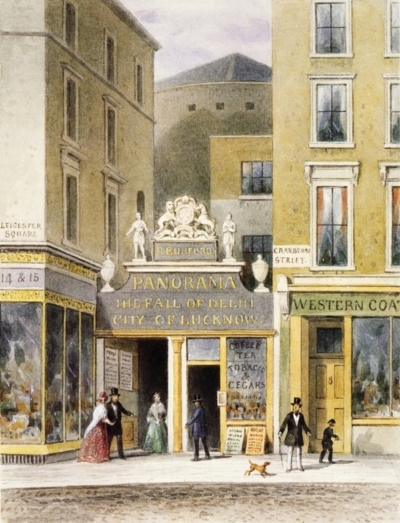 Though it no longer houses a panorama display, Barker’s panorama rotunda still stands, to this day, just to the north east of Leicester Square, facing Leicester Place. It is now the Roman Catholic Church of Notre Dame de France, and is tucked in between the Leicester Square Theatre and the Prince Charles Cinema. The long covered entryway from Cranbourn Street is gone and the rotunda itself is completely screened from the street by the two neighboring buildings and the new street facade on Leicester Place which was added to the church some time after World War II. But it is visible in an aerial view in this satellite image of the area. 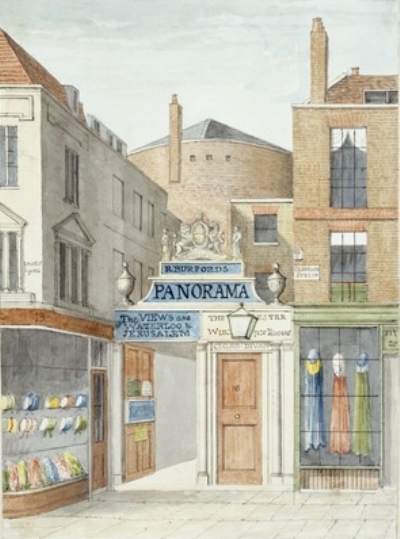 "Mr. Barker’s Panorama" remained a standard listing in many guide books of London entertainments from the end of the eighteenth century, rightthrough the nineteenth, until December of 1863, when the last panorama was displayed in the Leicester Square rotunda. Jon f Yes there was a door on the left of the vestibule that led into the church and the stairs down to hall and cinema. 1861. Cardinal Wiseman, Archbishop of Westminster, asked the Marist Fathers to establish a mission for the French community in London. Father Charles Faure was in charge of the project. 25 March 1865. Father Charles Faure bought a circular building off Leicester Square. 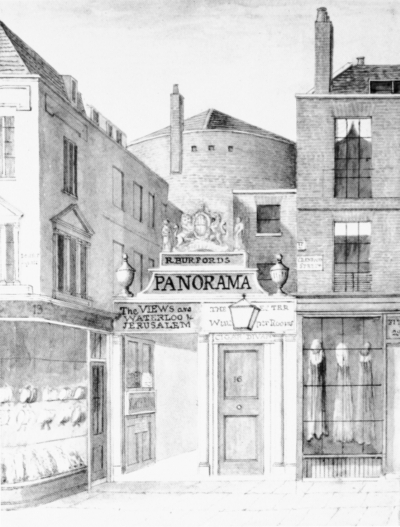 It was called the ‘Burford’s Panorama’ an early form of visual entertainment in the West End. It was built as a tourist attraction in the latter part of the 18th century. 1865. The French architect, Louis Auguste Boileau, was one of the promoters of cast iron architecture. He transformed the rotunda into a church, hence the circular shape of the present building. 11 June 1868. Consecration of the new church which was the first one built using cast iron in London. The church’s mission included a hospital, an orphanage and two schools which were run by the Sisters of Saint Vincent de Paul (Daughters of Charity). 6 November 1940. During the battle of Britain, two bombs caused substantial damage to the church building, fortunately without loss of life. 23 November 1941. The church reopened after extensive repairs overseen by the Superior of the parish, Father Laurent. September 1948. The full reconstruction of the church was authorised and managed by the new Superior, Father Deguerry. He had the support of the French Ambassador Jean Chauvel, the cultural attaché René Varin and the British Prime Minister, Anthony Eden. 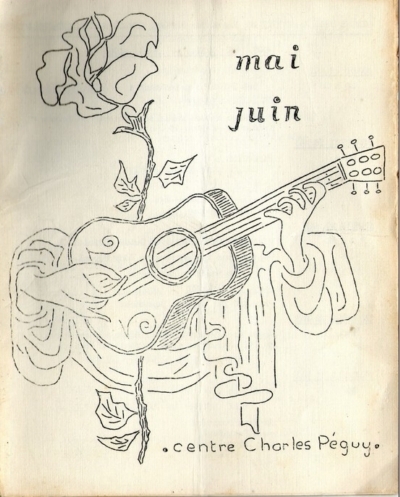 31 May 1953. Maurice Schumann, French Foreign Secretary, laid the foundation stone of the new building, which was brought from the Cathedral of Chartres. The architect was Hector Corfiato of Beaux Arts de Paris. 6 October 1955. Cardinal Feltin, the Archbishop of Paris presided over the official consecration. The new building was still in need of decoration. Cultural Attaché René Varin encouraged the creation of a sacred space, which would honour France. He approached eminent artists of the time. Chaplaincy of the Lycée, Conference of St Vincent de Paul, Our Lady of Walsingham Centre.